Dekeling hotel figures in my list of both budget and 2 star hotels. That's because it offers 2 star amenities at a rate that falls in the budget range. Interesting? Added to that is its central location on Gandhi road right opposite to the car parking. Yes it's on a relatively congested area, but only 4-5 minutes walk from the Chowrasta Mall. When you consider all the above, this hotel can be easily one of the top choices if you are looking for comfort with convenience, and willing to pay a rate little on the higher side in the budget range. Honestly, the hotel doesn't look too impressive from outside. You will need to climb up a narrow and quite steep staircase of an old building to reach up to the reception. 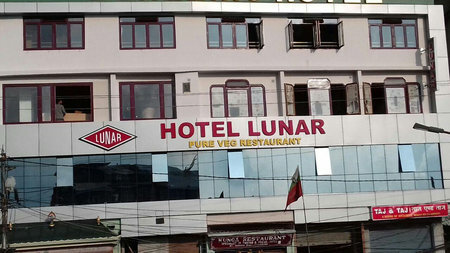 On the way up, you will find another hotel (Lunar) which is sharing the same building, but on different floors. Dekeling hotel is on floors above Lunar Hotel. As you walk up the stairs and reach near the reception area, the look of the staircase totally changes. It becomes a nice wooden staircase with great finishing. The reception area has a small well done up lobby. Right next to the reception counter, there is a board where lots of picture postcards hang. There are many tiny flags of various countries. It seemed to me as some kind of collections made by the hotel. 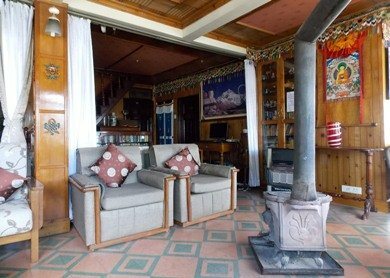 Dekeling Hotel is owned by a Tibetan Family, the Dekevas and is over 20 years old. 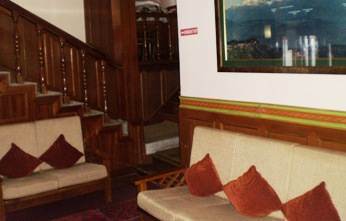 The family run hotels in Darjeeling are generally better choices because there is a focus on the details, and Dekeling is no exception. The owner Mr. Norbu Dekeva is a well known name in Darjeeling. He and his wife frequently supervise the hotel. Mr. Dekeva has also been deeply involved in many social activities. He is the founder member of Manjushree Center of Tibetan Culture. There are 28 rooms in Dekeling Hotel that are spread across several floors. On the lobby level, there are several Super Deluxe rooms. The rooms are arranged on both sides of an impressive corridor. 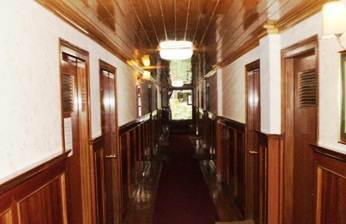 The corridor is wood paneled on either side as well as on the ceiling. The Super Delux rooms are all fully wood finished. They have LCD television mounted on the wall with all the standard satellite channels. The rooms also have two comfy chairs with table where you can relax and have tea. There are also nicely carved wooden cupboards in the rooms. The toilets are modern and have all the standard amenities including geysers and mixers. While some of the rooms have nice view of the mountain range, there are ones like 201, a Super Deluxe room that does not have a good view. The windows open to a building next to it. So while booking, ask specifically for view rooms. You don't pay any extra for the views. There is an Attic Deluxe room which is special. It is completely timber finished with slanted roof giving it a very pretty look. The room also faces the mountains and offers excellent views. However, if you are looking for a quieter room, ask for a back room. The front facing rooms can be quite noisy because the hotel is located right in the middle of a crowded street. There have been several rooms that are recently refurbished. These rooms are definitely much better than the older rooms. So keep this in consideration as well. Remember that Darjeeling has a long standing problem of power cuts. So although you have geysers in the bathrooms, you may not always get hot water. Also the beds are not made and bathrooms are not cleaned everyday. However, they will do it on request. The hotel has a lounge area as well as a library. The owners have huge collections of books which you can borrow. During the winter months, they arrange for chimney heating in the lounge. It's a nice place to sit & chat, and meet with your fellow guests. 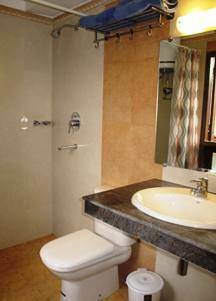 Other facilities include Wi-Fi internet access in the rooms, laundry, arrangement of transportation etc. See the old chimney heater, still used during winter. The family runs the Dekevas Restaurant which is located below at the ground floor of the building facing the main road. It is one of the nice budget restaurants in this area. You can either avail the room service to get your food from the restaurant or go down to the restaurant for your meals. They serve Continental, Chinese, and Tibetan dishes. The hotel supports different meal plans including EP/CP/MAP/AP. On service, my observation is that the staff in the hotel are quite nice. Although not perfect professionals, they cooperate and try to help as much as possible. Mrs. Dekeva, the lady owner deserves a special mention because of her knowledge about Darjeeling and the personal attention and care she extends to the guests. Below the hotel building and on the road there are several small shops including a nice budget restaurant Kunga giving a great option for Chinese and Tibetan food. There is an art shop called Indo-Tibet Arts selling various kinds of curios, jewelry and souvenir items. The shop Taj & Taj sells woolens and warm clothes. Dekeling Hotel is located opposite to the car park and taxi stand of Gandhi Road. It is right across the junction where the Gandhi Road, Laden-La Road and the Nehru Road meet. Nehru Road leads to the Mall with many shops on both sides. You can easily walk to the Chowrasta Mall from the hotel in about 4-5 minutes. 51 Gandhi Road, Darjeeling - 734101, India. 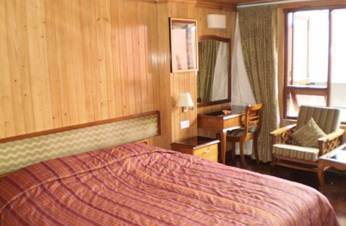 1) Darjeeling Top Budget Hotels for the best cheap hotels in Darjeeling.